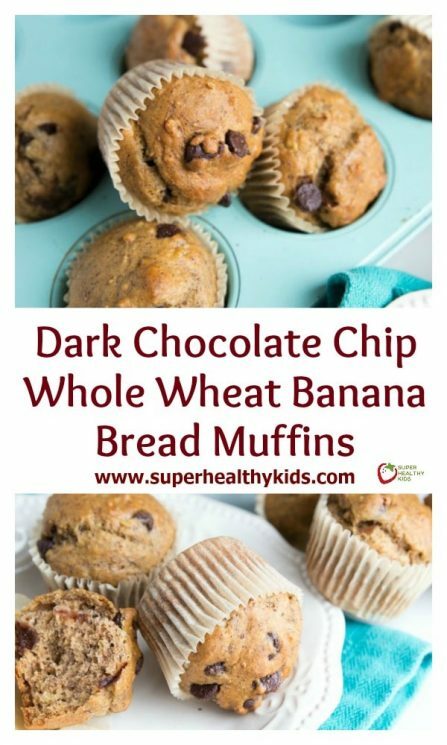 These Whole Wheat Banana Bread Dark Chocolate Chip Muffins are the perfect after-school snack. It’ll fill up those little bellies with a healthy snack but won’t ruin their appetite for dinner. Anyone else’s kid seem to be a bottomless pit? Honestly, I don’t understand it. Always eating. Always hungry. My kiddo gets a big breakfast, lots of lunch, and an adult-sized dinner. Yet, somehow, when he gets home from school, he is starving! We start off with a small snack so dinner isn’t spoiled. Still hungry. Then on to a piece of fruit. Still hungry. A bowl of popcorn. Still hungry. Dang! Am I alone here or is this just a normal growing-child situation? He’s only nine years old. I’m not sure what I’m going to do when he’s a teenager and is growing even more rapidly. And props to all you Mamas with more than one kiddo. Just my one is enough to empty my pantry on a weekly basis. 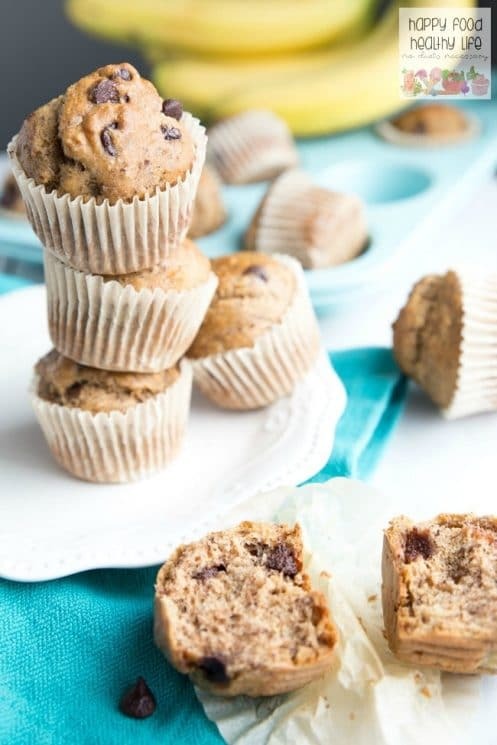 When it comes to after-school snacks, I’m definitely a fan of homemade over store-bought, and chances are, you feel the same way about making homemade treats for your kids. Don’t get me wrong. There’s a time and a place for some healthier store-bought snacks. Like on weeks when science projects are due, you have parent-teacher conferences, and the car ends up in the shop. Believe me, we all have those crazy weeks! So when you come across a recipe so dang easy that only dirties one bowl, you kinda have to jump all over it, right? Like my favorite banana bread recipe. It can easily be made in one bowl and takes just minutes to come together. Plus, I almost always have everything on hand for it, and I bet you do too. 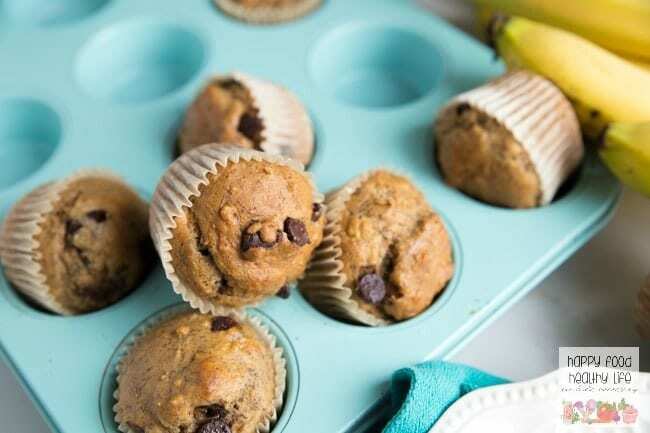 So I thought, why not turn my banana bread into muffins?! 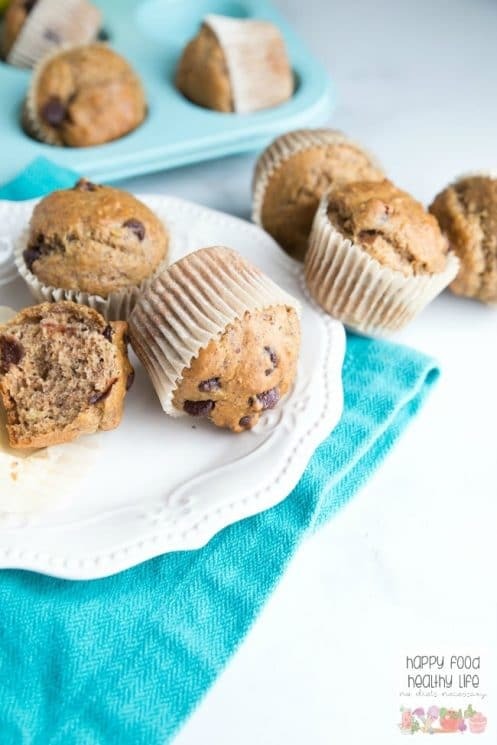 Perfect for breakfasts, lunches, and after-school snacks. It’s time to take out the muffin tin and line them with those cute pastel silicone muffin liner. So easy to make! These are great because they’re dense and filling. They definitely help to fill that seemingly bottomless pit that is my child. And what kid says no to dark chocolate chips in every bite? Definitely not mine! Holly shares healthy recipes, motivation, and fitness tips over at Happy Food Healthy Life. Combine ground flax and water in a small bowl, mixing completely. Set aside. In a large bowl, peel and mash the bananas until some course chunks remain. Add the applesauce and flax mixture, mixing until well combined. Mix in the sugar, brown rice syrup, vanilla, and cinnamon. Stir in the flour, baking soda, and chocolate chips, just until combined. Spoon batter into muffin tins, filling about 1/2-2/3 way full. Bake for 20-25 minutes, or until toothpick inserted comes out clean. I don’t see baking soda in the list – how much? And what can I substitute for the rice syrup? Thanks! I’m in the middle of making this and I just noticed that about the baking soda! It should be on the recipe 1 tsp. Thanks! Hi Kathy – it is 1 tsp baking soda. It is on the recipe – can you not see it? Kathy, I have often interchanged the brown rice syrup and pure maple syrup in recipes. Although I haven’t in this specific recipe, I think it would work just fine. In my opinion, brown rice syrup is a tad bit sweeter, so you may have to adjust the amounts to your taste buds. Enjoy! Thank you! Will try the maple syrup. Can I use maple syrup instead of the brown rice syrup? I have often interchanged the two, and although I haven’t in this specific recipe, I think it would work just fine. In my opinion, brown rice syrup is a tad bit sweeter, so you may have to adjust the amounts to your taste buds. I love whole wheat pastry flour as a sub for regular white flour in baked goods! I *try* to make a different batch of muffins each week and freeze them– or, I make 2 batches, twice a month. That way, I can easily pull out a healthy snack (warmed in the microwave) for my boy and there’s some variety, too. Hi Katie! 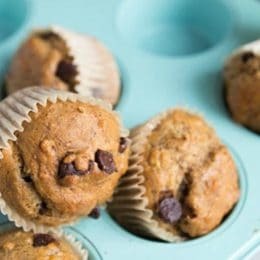 That’s so smart to make large batches of muffins often. They’re the perfect snack, especially for kiddos and on-the-go families. I agree, whole wheat pastry flour is the best. It’s a great sub, and the texture isn’t compromised very much at all. Depending on if your child eats school lunches or brings their lunches to school… Could be a reason for them to be ravenous when they get home. MY memory of school lunches (30+ years ago) we were allowed seconds. So, if your child eat school provided lunches, this could be a very real possibility. My kids eat school lunches too, and where they like SOME of the foods, they rarely eat an entire lunch… And then they are hungry when they get home. One kiddo eats breakfast about 7:30 and 3 hours later, lunch… They don’t get “snack time” because he’s in 6th grade and by the time he gets home at 2:20 — he’d gladly eat me out of house and home! Daily. And we don’t eat supper until 5:30-6:30 nightly. Where all the kids eat as much as their bodies need. As for this recipe — I’m going to try it! I’m positive my kids will devour these like nothing. Haha! What can you substitute the whole wheat flour for? I am struggling to find in Western Australia. it’s a little too moist, and spongey for my liking. they do taste and look great tho. it’s just a texture i wasn’t quite expecting. Texture is a little weird but nice flavor.